Russian composer Pyotr Ilyich Tchaikovsky wrote The Year 1812, Festival Overture in E-flat major, in 1880 to commemorate Russia's defense of Moscow against Napoleon's advancing Grande Armée at the Battle of Borodino in 1812. The overture is best known for its climactic volley of cannon fire and ringing chimes. The work begins in 3/4 time, with cellos playing Russian hymn “Oh Lord, Save Thy People”. 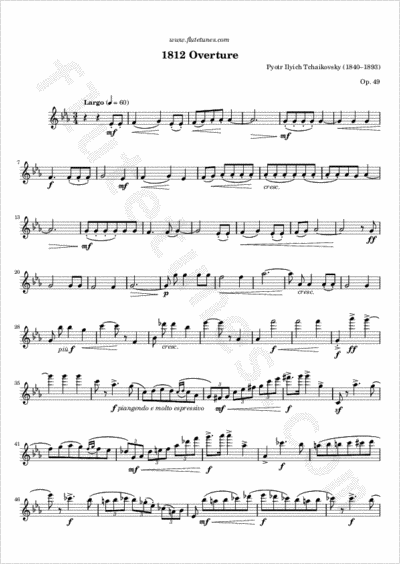 The famous main theme can be found at measure 78; in the original, this is a horn fanfare, representing the Russian military. We chose not to transcribe the full score, since the piece gets quite complex after that. In what follows, Tchaikovsky depicts the battle between the French and the Russian forces, represented by La Marseillaise and by the old Russian anthem “God Save The Tsar!”, respectively.